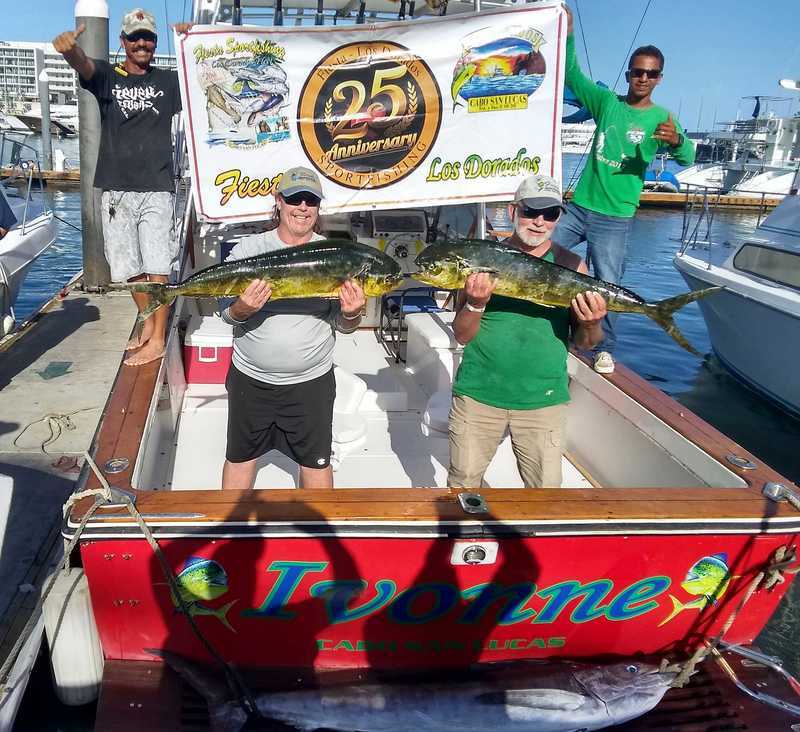 ​Let's go fishing!- Cabo fishing report- Fishing Cabo is good right now with our boats recently catching numerous Striped Marlin up to 150 pounds. 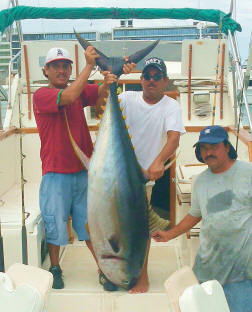 Although the Tuna remain spread out and sporatic, when they are biting catches of nice 15-25 pounders. Fishing is close to Cabo along with Striped Marlin close to shore along the Pacific coast line & up the Cortez to Punta Gorda. Dorados are in still in lower numbers with just an occasional 10-15 pounder. Striped Marlin are showing good, with most boats getting shots at 1-2 per day with at least 1-5 possible hookups. Larger Tuna have moved farther out, but boats making the run for them and finding them are scoring lots of 20-40 pounders - for those longer runs consider booking one of our new extended day charters for 10 hours to get to the Tuna Schools. Most of the Dorado are currently on the Pacific side from the Light house up to Migrino with 1-8 miles off Shore. A few surprise Wahoo have been brought in with numerous of the teethy beast cutting the line during battle or at gaff including an 80 pounder taken off the Dorado I. Inshore is still good for some large Roosters - up to 50 pounds & some Pargo & Jacks and Sierra are starting to show up for inshore action. 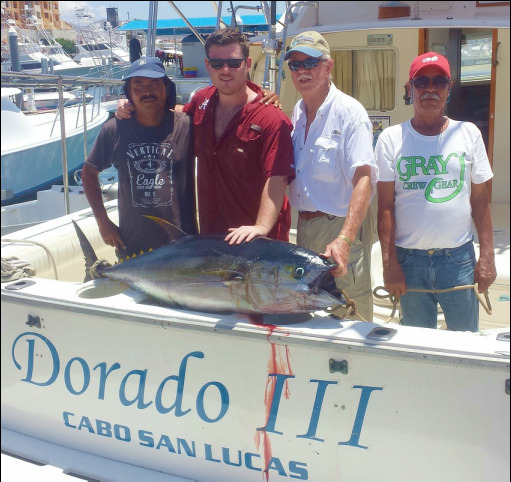 Spring is one of the great times to fish Cabo - call us for details - so come & Join us in Cabo Today! Don't miss out on this years trips we still have space- dates 26th Annual Fiesta Trip Nov 17-21st 2019- Early booking sales rates just posted! Puerto los Cabos- Our boats fishing out of Puerto los Cabos/San Jose have had some good days seeing Dorado Catches along with several Striped Marlin released and Tuna have been showing good around Gordo along with some nice size Wahoo. 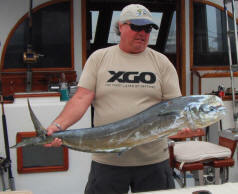 Inshore has been good for Sierra, Bonito, Toro/Jack Crevalle, Roosters & bottom fish. If staying in San Jose be sure to check out our boats available out of the new Marina "Puerto los Cabos". Fiesta Guided Trip Fishing Reports/Fish Counts from Fall trips 2013-18 heres what you could catch if you join us this year in 2019 for our 26th annual trip! 18 Anglers fishing on 5 boats 2 days returned with 13 Striped Marlin (all released) 110-150 pounds, 2 Sailfish (1 released) 80-100 pounds, 1 Rare White Marlin (released) 45 pounds, 19 Dorado 15-28 pounds, 1 Wahoo 34 pounds, 10 Misc bonita, tuna, skipjack. Cabo Nov 2014: Nov Trip Fiesta Guided Cabo Trip Fiesta 21st Annual Nov trip with 20 anglers fishing 2 days on 5 boats & 2 boats the 3rd day, returned with catches of , 11- Striped Marlin 120-150 pounds released, 2 Sailfish (released) 80-100 pounds plus 48- Dorados 15-23 pounds 48-Yellowfin 10-60 pounds, 4 Wahoo 20-30 pounds & 1 Skipjack Noted catches were on the Carolina for the 2 days, Warner Wells party from California fishing with skipper Beto, caught a total of 1 Striped Marlin, 6 Dorados, 18 Yellowfin & 1 Wahoo with the largest Dorado officially weighed at 22.8 pounds & the Wahoo 20 pounds. 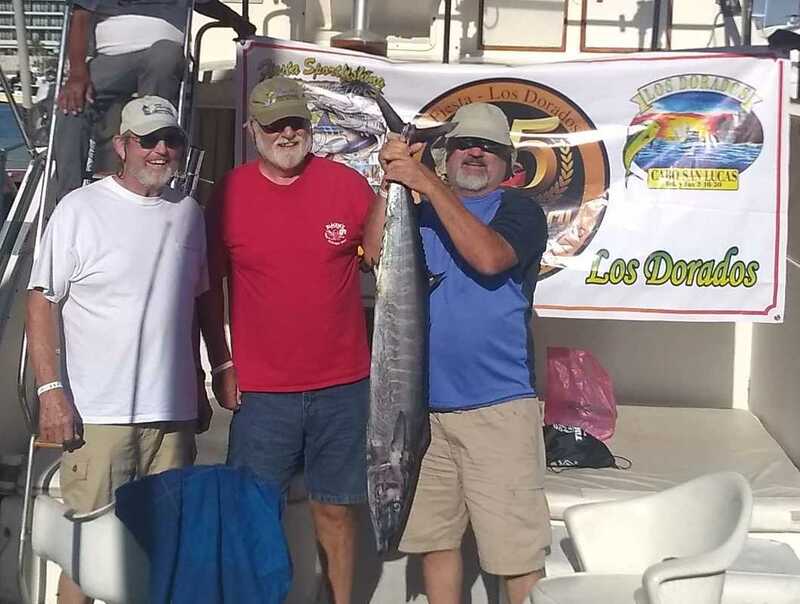 Also on the Dorado VII” Gary Hunts party of California fishing on with skipper Sammy caught 12 Dorado, 13 Yellowfin, 3 Wahoo & 1 Skipjack with the largest Wahoo officaly weighed at 28.5 pounds. 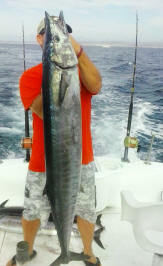 Fiesta Sportfishing 20th Anniversary trip - one of our biggest & best ever! 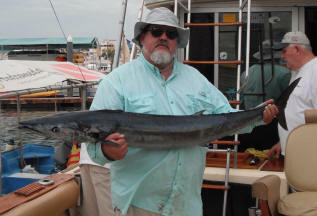 Cabo Nov 2013: Nov Trip returns with record Striped Marlin & Dorado catches for 20th Anniversary Fiesta Guided trip! 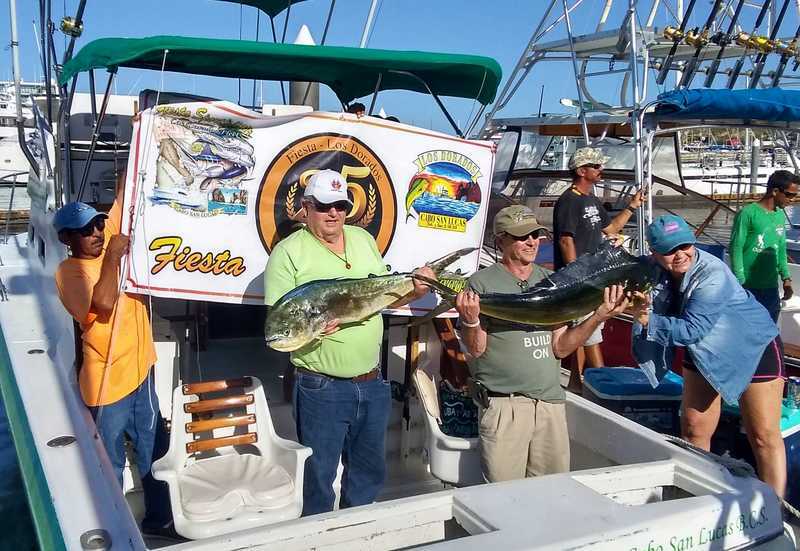 Fiesta 20th Annual Nov trip with 61 anglers fishing 1 day & 57 anglers 2nd day on 16 boats & 9 boats the 3rd day, returned with catches of , a record 74- Striped Marlin 100-150 pounds all released plus a whopping 100- Dorados! 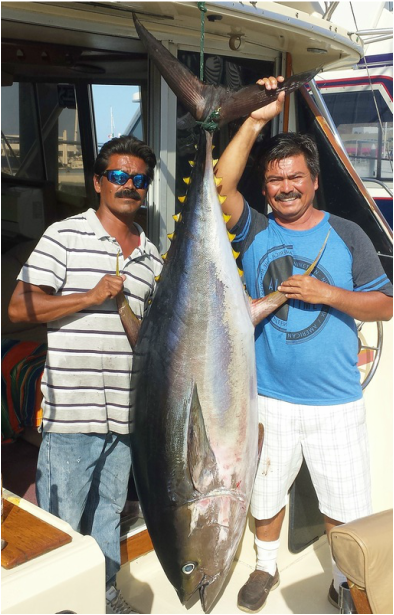 15-23 pounds, 12 Wahoo 25-50 pounds, 2-Yellowfin 15 pounds, & 1-Skipjack Noted catches were on Monday on the Gris Annel, Albert Romero caught a 48.7 pound Wahoo taking bigfish jackpot, and on the Dorado VII, Gary Hunts team released a 450 pound Blue Marlin along with 1 Striped Marlin, 6 Dorado & a Wahoo to take the Points Jackpot that day. On Tuesday, on the Dorado I, Byron Jones team Releases 8 Striped Marlin and 4 Dorado to take Points Jackpot that day. 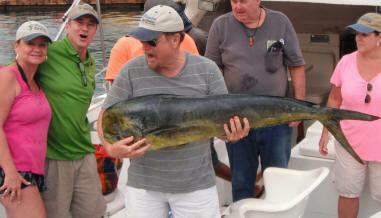 While on the Muchacho Alegre, Wayne Larson took the big fish jackpot for Tuesday with a 22.95 pound Dorado. Monday was Wahoo heaven with 9 caught & at least 7 others hooked & lost. And Tuesday the Marlin bite went wide open and set a Striped Marlin record with 56 Striped Marlin Released in once day!